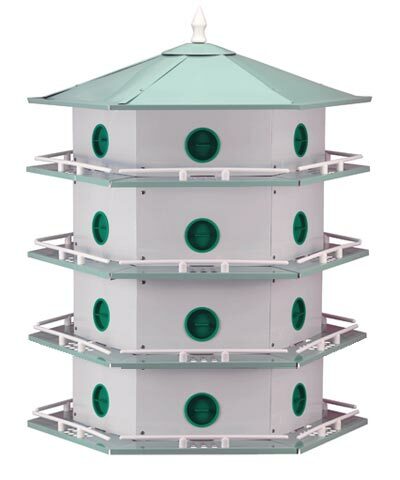 Provide a comfortable home for purple martins to colonize with the Heath Aluminum 24-Room Deluxe Martin House. This top-quality, easy to clean house is constructed of rust-free aluminum to dissipate heat, and its crisp white and soothing green exterior complements any lawn or garden. Each of the twenty-four trapezoid-shaped apartments measures 9" wide at the front, 3" wide at the back, 6" deep, and 6" tall to give individual martin families plenty of room. All the porches of the four story house feature drainage holes in front of the 2.25" diameter entrances and sturdy plastic perch rails for maximum comfort. The cupola conceals the ventilation hole, which helps regulate interior temperature. At the end of the season, once your martins migrate from the colony, use the included plastic door stops to seal the house and prevent aggressive squatter birds from taking over your colony. The house's levels are held in position with the set screw on the flange rather than being connected together, allowing you to easily clean out individual apartments on any level by snapping out the floor panels. Mount this house high atop the Heath Martin House Pole in an open space in your lawn. However you choose to display the Aluminum 24-Room Deluxe Martin House, the martins will love it and so will you. Screwdriver and pliers required for assembly.